Basic life support or BLS are performed on patients in a life threatening situation until proper medical care can be given. 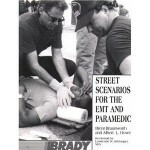 BLS is usually done on the scene outside of the hospital by any BLS strained medical personnel like EMTs and Paramedics. Basic life support can be performed without using any medical equipment. Anyone can acquire BLS skills after taking a BLS training course or EMT Training. It is required for firefighters and police officers to have BLS certification which is also useful to other professions life teachers and security officers. BLS is often associated with EMT Basic although it can also be used by higher levels. Basic life support skills are focused on maintaining airway, supporting breathing and circulation to provide enough blood to organs and deliver oxygen to cells. Airways skills like head tilt/chin lift and jaw thrust aid in keeping the airway open. Artificial respiration and giving emergency oxygen are breathing skills while bleeding control and CPR techniques are circulation skills. Making sure the victim and everyone else are safe. Checking the victim for consciousness and asking loudly if he’s all right. Trying to find out what is wrong and shouting for help if needed. Keeping the airway open and checking for normal breathing. Starting CPR, chest compression, and rescue breaths. Continuing resuscitation until qualified help takes over. Some situations like choking, drowning, and hypothermia, some points should be considered. Drowning victims that are unresponsive should be given CPR as soon as possible, finding the severity of choking, and checking the pulse and breathing for half a minute or more when the victim has hypothermia. There are some differences to adult and children basic life support, cardiorespiratory arrest is not common to children and origins of arrests requiring separate algorithm for health care professionals. Giving adult BLS to children should be given rather than doing nothing. It is also important to know the differences between infants and children. The basic life support guidelines can be found here for UK and here for US.